For most of us, there comes an age when we look at ambitious, deadline-specific workout plans and our eyes instantly glaze over. Bigger arms in two weeks? Been there. Six-pack abs in six weeks? Only if it includes 3 sets of weighted eye-rolls. Sure, those types of plans have their use. But once I hit 40, I found that my priorities changed from simply growing to knowing that what I was doing would sustain me for more than a few weeks. In other words, I wanted to master the fit lifestyle more than ever. Easier said than done, right? Not if you plan your day out ahead of time. Here are four things you need to do every day if you want to defy Father Time and stay jacked for life. I am a very detailed person, but that wasn&apos;t always the case. Although I was training regularly and eating healthy food, I never took the time to pinpoint exactly what my goals were or how to go about achieving them. After a while, I was pretty much in a holding pattern. Then I came up with this simple checklist of questions, and it changed everything. No matter my goal, it helped me stay on track and succeed at it. What is my definitive overall goal? Have I done everything in my power to reach that goal today? What progress do I see and feel, and am I moving in a positive direction? Is my nutritional plan customized toward that goal? Have I strayed/cheated from my nutritional plan today? When and why? Was today&apos;s workout customized toward my goal? Did I give a good effort during today&apos;s workout session? Did I skip any exercises, and why? Do I get enough sleep and rest? Do I need to make any changes to my plan? Meet your goals! Download Frank Sepe&apos;s 12 Daily Questions. How does it work? Like anything else, with lots of reps. Every single day, I answer every question in a journal. If something isn&apos;t working or I&apos;m not progressing fast enough, I have a record of exactly what I did, and I&apos;m able to tweak it in order to ensure success. Without it, I&apos;m blindly trying to figure out why my program isn&apos;t working. Sound familiar? Questions 1, 5, and 7 might seem like overkill. You know your goals and whether or not what you&apos;re doing serves them, right? But do you really? Read the first question again. Your goal needs to be definitive. Every day, reconfirm your overall goal, your nutritional plan, and your workout program. And be honest! Believe me when I tell you that this huge ritual makes a huge difference—as long as you take it seriously. Writing all of this information down makes it real and verifiable. It&apos;s there in black and white, a commitment that I made to myself. The biggest mistake I see people making when it comes to their nutritional program is not customizing it to their current weight, calorie expenditure, and fitness goal. You can&apos;t just rip someone else&apos;s diet out of a magazine and follow it verbatim. For instance, there&apos;s this one out-of-shape guy in the gym who is over 300 pounds, and he&apos;s following the plan of an Olympic track star who is 175 pounds and about 6 percent body fat. Tell me if you know how this story ends. If you want results, you need to have each of your meals planned—and even better, prepared—before you leave the house in the morning every day. Of course, there is one thing you can learn from elite athletes: their single-mindedness. They don&apos;t waste meals, because they know that each one matters to their performance. You can benefit from that mindset. So let me say it bluntly: If you want results, you need to have each of your meals planned—and even better, prepared—before you leave the house in the morning every day. If you can&apos;t imagine how that works, let me give you a hint: It starts the day before at the latest. While you&apos;re at it, make sure you have an extra meal option in case something comes up or your plan hits a snag. It can be a bar in your bag, a shake in the car, or a food-carrier with Tupperware inside, but have something—and more specifically, something healthy—there when you need it. Use shakes and bars. They&apos;re just too easy to feel bad about. I&apos;m a believer in whey, vegan protein, and my go-to bar, the Met-RX Prime bar. Write down the times you ate in your journal, not just what you ate. 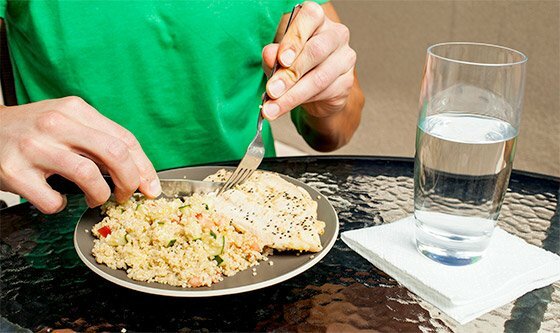 Optimize pre- and post-workout nutrition—not just breakfast, lunch, and dinner. Drink water. Not much of a hack, you say? So how much of it are you drinking? Keep an extra meal with you at all times. Call "comfort foods" what they are: cheat meals. You&apos;ll be more likely to eat them in appropriate amounts that way. Training has been part of my daily routine since I was 13 years old. I don&apos;t do it because I have to. I do it because I love it! I see many people struggling to cram all of their training into a three-day split. This is why I spread my training across five days. I can effectively plan around it, rather than feel rushed. Then I run this split back-to-back, meaning I usually train about 10 days before I have a rest day. I wouldn&apos;t suggest you jump right into training like this. I just know that my body does better with a lot of frequency, and I&apos;ve learned how to find the sweet spot of intensity that allows me to train and recover every day. To me, this is the norm. I see many people struggling to cram all of their training into a three-day split. This is why I spread my training across five days. Don&apos;t get me wrong. If I ever feel run down, I take a day off. I&apos;m not saying throw caution to the wind—absolutely not. Just don&apos;t be afraid to follow your own instincts. My instincts almost always tell me to hit the gym. Sometimes you need to think outside the box to fulfill certain physical and mental needs. I incorporated Bikram hot yoga into my training regimen about 5 years ago, and I could spend hours writing about the positive mental and physical changes I&apos;ve personally experienced by performing the 26 postures in this 90-minute, 105-degree class. Was it difficult at first? You bet! But I stuck with it, and today, I find that what it provides can&apos;t be duplicated in a gym. I recover better, move better, feel better, think better—you name it, I&apos;m better at it. Open your mind and look for something that will do this for you. Sometimes you need to think outside the box to fulfill certain physical and mental needs. When I can&apos;t do my yoga, I do some cardio or MMA training instead. With the right mindset—one which yoga has helped me develop—all of these activities can be rejuvenating in their own way. Many people will say you&apos;re wasting your time in the gym unless you&apos;re strictly following a certain program. Not me! I believe you should customize your own program. I add or change exercises and switch up rep patterns and combinations based on how I feel that day. The days I feel like I can handle more, I push myself a little more. Not everyone is able to do this, but I believe that&apos;s because most people have fallen out of touch with their physical capabilities and limits. Try structuring your life around these four pillars I&apos;ve outlined here, and you&apos;ll find yourself a more self-aware, self-directed lifter. You can do this. Just take it—you guessed it—one day at a time. Check out Met-Rx&apos;s complete supplement lineup! No need to wait until New Year&apos;s to start transforming your physique. The best way to crush your goals is to start now with this killer plan. Healthy Recipes: 6 Protein-Packed Treats You&apos;ll Love! Eating enough protein is as easy as saying "chocolate-banana soft-serve protein ice cream" three times fast. Enjoy all six of these delicious treats! Don&apos;t feel guilty about extra holiday calories; put them to use! Here&apos;s how three MET-Rx athletes work out during the holidays so they can have their pecan pie and eat it, too. Frank Sepe is the Editor-In-Chief of MET-Rx Magazine and a fitness author with five books to his credit. A man of many talents, Frank is here to help!